Most smartphone makers aim to build a device which millions of people will want. Whether that be an all-singing all-dancing powerful and stylish flagship, or a more affordable device that offers value for money. Under TCL's lead, however, BlackBerry Mobile isn't seeking to achieve either of those two things in the Key2. It's a different kind of phone, with a different way of thinking, its physical keyboard standing apart from the typically touchscreen-only devices of today. The Blackberry way won't be for everyone, but for a particular audience the Key2 will strike the perfect balance of personal and business productivity. Indeed, it's the best example of modern BlackBerry to date. There aren't many simpler ways to describe the design of the Key2 than to say it looks like a modern BlackBerry. The bottom third of the front is taken up by that physical keyboard, the rest is predominantly screen. The Key2 is lightweight yet solid, thanks to the chassis being made predominantly from 7000 series aluminium. Although it's only 12 grams lighter than the KeyOne, the Key2's in-hand feel is vastly different - as though it's much lighter. Both the iPhone 8 Plus and Google Pixel 2 XL are heavier comparisons. With a front covered in Corning Gorilla Glass, a sturdy frame and a grippy plastic back we felt comfortable using the Key2 case-free without worrying about damaging it. Saying that, the back does have a habit of showing up finger grease and its diamond finish looks overly plasticky, in a cheap kind of way. We prefer the feel of the softer-touch KeyOne and BlackBerry Motion. One important change in the Key2 is the placement of the power button. In previous BlackBerry Mobile devices it was placed far out of reach in the top left corner, which isn't good for anyone who isn't left-handed. The Key2's power button is placed just above the halfway point on the right side, which makes it perfect for the right thumb or a left index finger. It's textured, too, so it's very easy to press. However, rather than do what almost every other Android manufacturer has done in recent years, BlackBerry Mobile has decided to stick with a row of capacitive home, back and recent apps buttons on the Key2. That means there's a good centimetre of black bezel at the bottom of the screen that's only used for those three buttons. This doesn't just stop the screen from appearing more edge-to-edge, but also separates the physical keyboard from the onscreen software controls and predictive text toolbar (which pops-up when typing). It feels like a needless barrier in an age when gestures or virtual on-screen buttons are the norm. It'd also be nice to see BlackBerry Mobile doing something more ambitions with the display, like making it 16:9 with much slimmer bezel, no capacitive navigation buttons and just a keyboard. Surely that's the flagship BlackBerry phone that 2018 deserves? Not having the bottom bezel would have enabled TCL to build in a longer display, making the Key2 a little better suited for media consumption and mobile gaming. As it stands, however, the 4.5-inch panel isn't the biggest screen going, while its 3:2 aspect ratio means there's some serious letter-boxing on videos, especially those newer 18:9 movies and TV shows that you'll find on Netflix. We already knew that would be the case, though, as it always has been for phones with physical keyboards on the front. But it's not all bad news. The Key2 might not be the most media friendly device going, but when watching shows like the BBC's cinematic masterpiece, Blue Planet II, we were pleased with the rich colours and depth on offer. It's also an IPS panel, which means details are crisp and viewing angles are very good. Whites on screen are clean, while details are sharp on account of the small scale and high pixel density. In some ways, the 3:2 ratio is actually optimal for browsing through inbox feeds, calendars and emails. Being narrow often means text is pushed down to the next line, but this BlackBerry's ratio can sometimes feel better equipped for text-based activities. It's a quality experience. For some, nothing replaces typing on a physical keyboard. Ask most still-loyal BlackBerry users and they'll tell you that. Now, while the KeyOne - the first classic BlackBerry form-factor device running Android - was a good keyboard phone, its keys weren't quite as good as the ones on devices like the earlier Bold 9900. 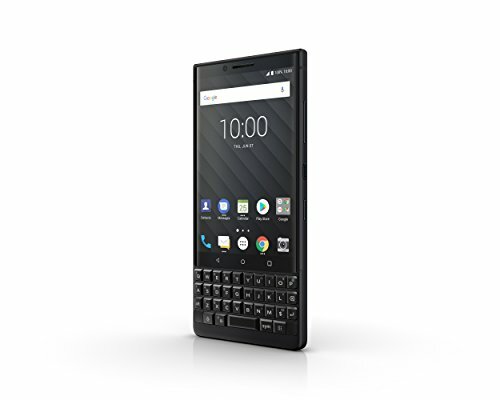 So for the Key2, TCL's designers took it back to the drawing board and came back with keys that are bigger and clickier, producing what we think is the best physical keyboard since the BlackBerry Classic. The Key2's keys are fairly large, square-ish and feature a more matte finish, making typing really easy. Well, easier than using the smaller glossy keys on the KeyOne - switching from those keys onto these is a sigh of relief for the fingers. The travel of each key gives just the right amount of click in response to being depressed. The keyboard is touch-sensitive too, so you can quickly swipe up to select predictive words that appear at the bottom of the screen. One really useful feature is the ability to bring up a cursor whenever you're typing just by double-tapping (not clicking) on the keyboard, then swiping up, down, left or right to place that cursor. Similarly, there's an easily accessible clipboard that stores the last items you've copied as well as an onscreen directional pad. The only issue we find with the keyboard is the inconsistent experience of the space bar compared to the rest of the keys. Our review device's space key didn't feel as solid and didn't seem to travel as far as the others. This irked us at first, but after a few days it felt like the norm. Despite that single issue, the Key2 offers the best physical keyboard we've seen in the Android-powered era of BlackBerry phones, and with the addition of shortcuts and other touchscreen modes, it's the most versatile and powerful too. One new keyboard feature that quickly becomes one of the most used in the Key2's arsenal is the Speed Key. With various apps and actions applied as shortcuts programmed to our desired letter keys, it's great being able to switch instantly from one app to another without needing to go to the recent apps view or home screen. When we say instant, we mean it too. It takes just a fraction of a second to go from one app to the next, once programmed. We could hop between Instagram, Facebook and Messenger by pressing the Speed Key along with I, F or M, respectively, once we'd chosen to have those be the shortcut keys in the settings. However, better optimisation from some third-party apps would make for an even more fluid experience. When typing messages or comments, pressing enter or alt+enter to quickly send your message seems like a no brainer, but it only works with some apps (Facebook) and not others (WhatsApp), for example. As you'd expect from a BlackBerry the software has plenty of security focus too. The DTEK app remains, keeping you up to date with the security status of the phone and managing which permissions have been accessed by apps. There is one really good new addition: the updated Locker. When activated, you can add files, images and apps and lock them behind a password and/or fingerprint scan. It's great peace of mind. The Key2 doesn't have the most powerful processor inside, but the Snapdragon 660 is more than capable. The Key2 coped with whatever we threw at it in terms of usage demands. As we've mentioned, the Speed Key app is snappy and quick, while loading games doesn't take that much longer than a high-powered flagship. Which is ideal for those brief times on your work day when you need to distract yourself with a quick round of PUBG. The Key2 lasts for a long time per charge too. The battery didn't go flat before the end of the day during our week with the phone. Lighter-use days we could comfortably make it last to late afternoon/evening on a second day. With careful management we suspect some will manage two full days from one charge. Now that's great. There are two more important reasons why you shouldn't ever need to worry about battery performance on the Key2. In addition to lasting ages, there's Quick Charge 3.0 support, meaning it fills up pretty speedily. Plug it in for 20 mins or so at lunch time and it'll have more than enough juice left to get you to the end of the day. There's also a power management feature in the software that learns your charging and usage patterns, which pops-up a handy notification when it thinks you need to plug it in for a refill. Keeping up with modern trends means BB has added a secondary camera on the back of the Key2. This means its dual system is capable of producing those portrait mode shots with depth effect and background blur. The results aren't particularly special, but they're fine and just about as good as any others we've seen (i.e. imperfect). Like most, it can sometimes blur the edges of the subject, but in good light with good contrast separation between subject and background, results look decent. As for the rest of the photos, it's safe to say the Key2 does much better with even daylight than any other conditions. With harsher and contrasting light conditions the phone has a habit of overblowing highlights and washing out colours a little. There's also an HDR mode which seems to make contrast a bit too high and ends up producing slightly unnatural images. In low-light results aren't that great. We've noticed some image noise in shadows as well as some blur, even when the brightness hasn't dipped much. Similarly, the front-facing camera can take selfies, but the colours and sharpness aren't fantastic. In the end, the Key2's camera is an improvement over the KeyOne, but the end results still don't match what we've seen from other smartphones. Even in the sub-£500 market, cameras from the likes of the OnePlus 6 and Honor 10 are more dynamic, detailed and better equipped to deal with varying light conditions. The Key2 is the best example yet of modern BlackBerry. Its keyboard is massively improved over the KeyOne, the battery will get through a whole day with ease, and the Speed Key makes it easy to get things done quickly. However, there's no doubt that the Key2 is a niche phone for a specific audience. Many won't want a physical keyboard, the screen feels small as a result, while power is a little behind the flagship elite. We can't help wondering what might be if TCL really went all out on this phone. With the launch of the Key2, the KeyOne's price has dropped considerably. At £349 from some retailers, it's more than £200 cheaper than the Key2 and offers nearly all of the same benefits. It might have a smaller keyboard, but it's just as long-lasting and reliable as its follow-up. If you want a big, long-lasting and powerful phone for being productive without reverting back to a physical keyboard, the Galaxy Note 8 is one of the best out there. It's well designed, waterproof and has that versatile S-Pen for taking notes, drawing and marking up documents. What's more, Samsung's software has its own security-focused elements too.